Say the words “Koch years,” and a flood of images pours forth (bankers in yellow ties, break dancers, gay bathhouses with caution tape across the doors). Ditto with “Dinkins years” (the “gorgeous mosaic,”, tennis rackets, Crown Heights riots), “Giuliani years” (squeegee men, Derek Jeter, Twin Towers) or “Bloomberg years” (bike lanes, luxury condos, waterfront parks). Love ’em or hate ’em, each of them had their drama. The “de Blasio years”? The mind goes blank. It’s hard to say, four years in, what represents this era. Gourmet food trucks, maybe? Food halls? As the mayors got taller, the mayoralty got smaller. Mayor Bill de Blasio at a press conference in the Bronx in December 2016. Mayor de Blasio’s New York is neither a city on the brink (despite this past week’s deadly terror attack). Crime is down, and test scores are up, but few seem to be paying close enough attention to know that. Despite the presence of Mr. Sanders, the hall was maybe half-full. Efforts to get a “four more years!” chant faded quickly as the mayor, looking like a retired Knicks power forward (he is 6-foot-5), rose to tower over the podium in a gray suit and yellow power tie. 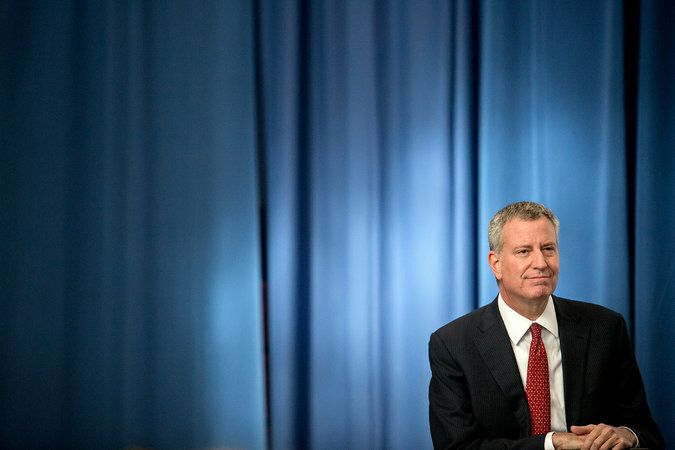 “I want to start with a tale of audacity,” Mr. de Blasio said, sounding more amiable than audacious, before ticking off his administration’s accomplishments, which included universal pre-K, two rent freezes and free legal counsel for people facing eviction. But the mayor tacitly acknowledged that he is more of a conduit for a political philosophy than a lightning rod. 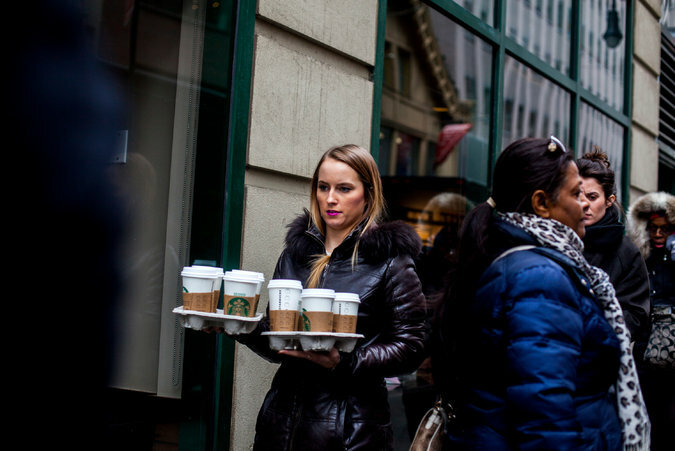 A Starbucks customer carries drinks in the financial district of New York in Febrary 2015. Mayor de Blasio’s movement, such as it is, has left a mark. Despite howls that changes to policing would send the city spiraling back to the “Death Wish” 1970s, school crime is down and major crimes are down 9 percent during his tenure — with, the administration says, a 93 percent reduction in the “stop and frisk” tactics by police that long have marred the daily life of, in particular, young African-Americans. What’s more, a recent Quinnipiac University survey reported that 82 percent of likely African-American voters expressed a favorable opinion of the mayor. The problem is that Mr. Giuliani long ago cemented his legacy as the crime fighter mayor in the public imagination, however deserved that may be. Any mayor who follows is simply Crime Fighter 1B. Mayor Bloomberg never achieved quite the same action-hero persona, but as an archetype of the politician-as-C.E.O., he was nationally famous enough that he is still having to explain why he did not grace the 2016 presidential ticket with his presence. Mayor de Blasio, in theory, might someday enter the White House (without joining a group tour). But as what, exactly? What is his “brand?” Many of his administration’s headline-making initiatives seem comically pointillist in scope, even absurdist, as if conjured by a late-night Mad Libs sessions in City Hall. Who can forget the crackdown on motorcycle wheelies? The striking down of the ban on ferret ownership? The new curbs on subway pole dancing? That is the outsider’s view, anyway. To those who work in or around city politics, this administration has been anything but dull. The mayor — at times feisty, at times aloof — has become embroiled in countless headline-grabbing tussles with the tabloids, the police force and, Gov. Andrew M. Cuomo, a fellow Democrat. He has had to fight off both a state and federal investigation into his fund-raising. Legacy, however, is about perception, not policy, and when it comes to perception, timing is everything. It is neither fair nor sane to credit (or blame) a mayor with everything that happens in the city on his watch. Everyone does it anyway. New Yorkers, for example, tend to forget the patronage scandals and crack wars of the years under Mayor Edward I. Koch. What they remember is “Hizzoner,” a cuddly cartoon vision of an irrepressible New Yorker who we think brought New York back from the dead. Mayor de Blasio, by contrast, inherited a city that was in fine health, but even so, we’re left feeling around for its pulse. The next year, Moby, the techno pioneer, tea shop entrepreneur and longtime cultural truffle pig, went so far as to declare Los Angeles, not New York, the new mecca for young bohemians, in another Guardian essay. Having done the Horace Greeley thing himself, Moby, a former East Village resident, hailed his new West Coast headquarters as a place where young artists “can really experiment” — and live cheap and fail fast. This creeping bouge-ification that left the city a sea of chain stores and Starbucks did not happen overnight. But even Mr. Bloomberg had the Strokes. Those tattooed New York cool kids who haven’t yet decamped for Silver Lake might at least give Mayor de Blasio credit for trying. His tenure has seen the loosening of marijuana enforcement (low-level possession often results in a summons, not arrest, particularly for whites), and the overturning of the oft-derided cabaret law, which made it illegal to dance in bars, going back to the days of the Charleston. Even so, the aging hipsters who forever croak about the grit and glamour of the bad old days will hardly find solace in a New York where CBGB is still a John Varvatos boutique, smoking remains taboo unless we’re talking lox at Barney Greengrass, and the police hand out $190 tickets for running a red light … on a bicycle. Sodom and Gomorrah this ain’t. Maybe we should count it as a blessing that, after a four-decade journey back from the brink, New York as a whole has, for what may be a very brief moment between recessions and terror attacks, the luxury of worrying about small things. You could say this expenditure of city resources on a marginal issue was a measure of a city shrinking in its historical mission. Or, you could say it is a sign of victory. For now.